Why Didn’t DOJ Look More Closely at DTRA’s Role in 2001 Anthrax Attacks? The 317,000 square foot DTRA headquarters opened in 2005 to bring together the agency's 2000 employees. The last entry on the list is what stands out. 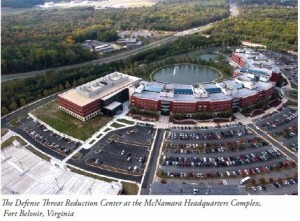 The Defense Special Weapons Agency was folded into the newly formed Defense Threat Reduction Agency, or DTRA, in late 1998. And DTRA was important to me because they were the agency that carried out Project BACUS, first reported by Judy Miller on September 4, 2001. Miller’s Times article described DTRA building a facility at the Dugway Proving Grounds in Utah Nevada Test Site with a 50 liter fermenter capable of producing bioweapons microbes. The project was an exercise to determine how difficult it would be for authorities to spot a bioweapons production facility built by terrorists. Later, I found that in her bioweapons book published in 2001, Miller disclosed that the BACUS facility also is capable of weaponizing bacterial spores. https://www.emptywheel.net/wp-content/uploads/2016/07/Logo-Web.png 0 0 Jim White https://www.emptywheel.net/wp-content/uploads/2016/07/Logo-Web.png Jim White2011-11-30 12:31:022011-11-30 16:48:50Why Didn't DOJ Look More Closely at DTRA's Role in 2001 Anthrax Attacks?